A series of spread sheets have been set up to provide a framework of observations and questions as a "guided discovery" exercise to clearly demonstrate the observations that a master petrographer would make. The observation of a thin section is broken down into a series of manageable tasks: reconnaissance overview of the thin section at low power; followed by creation of a systematic inventory of the rock-forming minerals (stable mineral paragenesis), alteration phases, and accessory minerals; and finally, analysis of the textures of igneous, sedimentary and metamorphic rocks. Comprehensive lists of a) optical determinations, and b) textural features are provided as "cues" to the student to help focus attention on the full range of observations that could or should be made towards a comprehensive petrographic analysis of the thin section. These sheets are organized to include: Consideration of the geologic context of the sample: What is the geologic setting where the rock was collected? What is the rock type (if known), or at least is it igneous, sedimentary or metamorphic? This type of contextual information will help guide you to interpret what minerals are likely to be present (or excluded) in the sample Mineral Optics (identification of mineral phases in thin section. Observations at low power in plane and cross polarized light. Systematic characterization of the (stable) rock-forming minerals Identification of a) secondary or replacement minerals, and b) important accessory minerals; Description and Interpretation of Rock Textures Igneous rocks Clastic Sedimentary rocks Non-clastic Sedimentary rocks (carbonates) Metamorphic rocks Applications; can these minerals/assemblages/textures be used to determine source area, physical conditions (thermobarometry), geo- or thermochronology, and other useful geologic information? Initially, use of these spread sheets will appear to be prescriptive. However, given the complexity observed in Nature, no single set of questions can be universally applied to all types of samples. So, the steps and observations represented in these spread sheets provide a general framework--a place to start--and the lists of optical properties and textures are meant to be a reminder to students about the types of observations that should be made. Students can use these spread sheets as a guide to make decisions about what is important and useful for the overall interpretation. 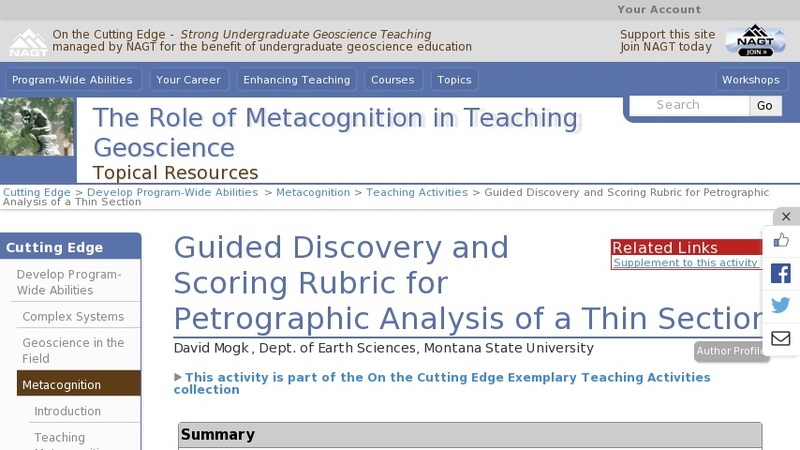 Metacognitive components of the activity Students derive an awareness of their own learning processes by considering "what" they are doing and "why" they are performing certain operations on the petrographic microscope. Students monitor their own progress by considering a) what they expect to find based on geologic contexts, b) are their observations and interpretations consistent with what can (or cannot) occur in Nature, and Adjust their learning strategies to accomodate new lines of evidence towards formulation of internally consistent (if not "correct") observations and interpretations of the thin section. Metacognitive goals for this activity: The first encounter with an unknown thin section can be both confusing and overwhelming: Where do I start? What should I look for? How should I proceed? How will I know if I'm doing the right thing, and making the right observations?.... The purpose of this exercise is to "unpack" the steps taken by a master petrographer, to describe "what" observations can be made, and explain "why" these steps should be taken, what the utility or significance of the observations is, and how these observations can be appropriately interpreted (often these observations are done instantaneously in the mind of the petrographer, but in this exercise we try to explicitly outline these steps). With practice and experience these steps will become second nature. The goal of this exercise is to help students master the art of petrography so that they can independently do petrographic analysis of any rock from any context. Assessing students' metacognition In the course of teaching petrography in my regular coursework, I find that I continually articulate to students (one at a time) what I am doing (and why), what I am seeing (and they may or may not be seeing the same thing), why certain relationships are to be expected or prohibited in Nature (by considering the larger geologic context). The development of these guided discovery activities is an attempt to clearly articulate to all students the steps that are routinely taken in the petrographic analysis of a thin section. The goal is to more efficiently and effectively get students past the "mechanical" stages of mineral identification and textural descriptions, and help them to begin to develop higher order thinking skills of application, analysis, synthesis, and evaluation.